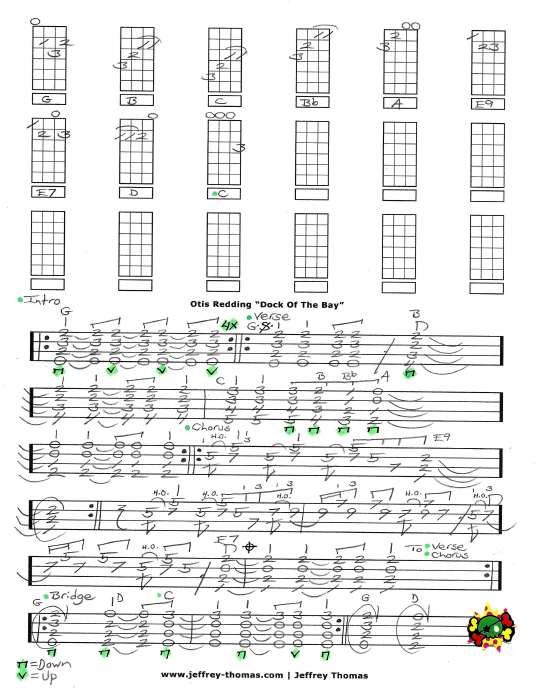 Dock Of The Bay Free Ukulele Tab by Jeffrey Thomas. Learn to play this r&b, soul classic with my free ukulele tab arrangement. I tried to get as many of the signature guitar licks as possible for you. This is a very solid vocal accompaniment version that will have you sounding very authentic. Want the full ukulele tab for free? Just send in your email address using the form provided. Looking for online ukulele lessons? Fill out the Schedule A Free Lesson to set up your free Skype ukulele lesson today! “Dock Of The Bay” was written by Otis Redding and guitarist Steve Cropper. The song became the first posthumous to top the charts in the U.S. Find more great, free online ukulele tabs on my video, blog and tabs pages.